House Finches are never loners. They are very sociable and you often see them at feeders. I hung a feeder outside my office window so I don't get bored from gazing my computer monitor. Many birds visit this seed feeders throughout the day, such as Eastern Bluebirds, Chipping Sparrows, Northern Cardinals, warblers, Red-bellied woodpeckers and even Brown-headed Cowbirds. 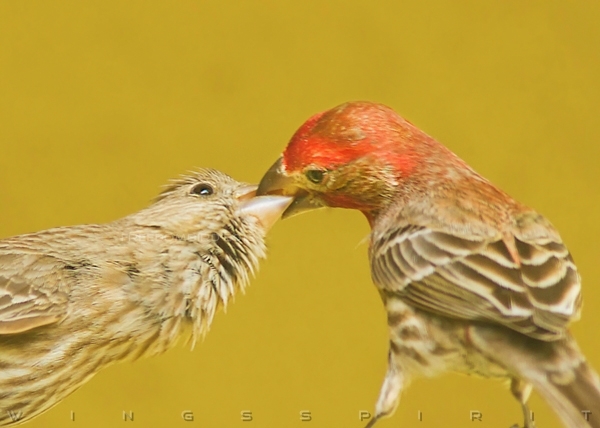 While a bluebird chasing a cowbird away from his territory, this male House Finch showed his lady what a handsome bird he really is. I happened to have my camera on stand by mode and caught a short video and like to share with you. We watch this play out on our feeders, too. "Our" male also has a display in which he jumps over the female back and forth from one of her sides to the other on our balcony railing while singing. She ducks down a bit and watches him hopping over her head! By they way, we're in the Florida Keys right now and covered up with Ospreys!